Stunning 6 Bed Spacious Villa, Games Area with 8ft Slate Pool Table, foosball & Air Hockey, 30ft X 15ft Pool & Spa, Luxury Pool Furniture, 42" LCD Widescreen TV, Cable TV In All Bedrooms , DVR Recorder, Computer With High Speed Internet Access, Wireless Network, XBOX With Games & Play Station 2 With Games, Totally Private Fenced Garden - Not Overlooked, Gas BBQ / Grill, Baby Equipment - High Chair, Cot, Stroller. Everything you'll need whilst away from home! 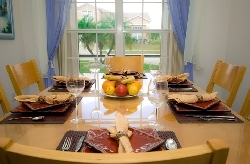 A beautiful villa located in the tranquil setting of Crescent Lakes . Still only 15 minutes away from Disney and all of Central Florida 's attractions. With golf, fishing, horse riding and theme parks on your doorstep there is something for everyone. The downstairs has a substantial lounge with 42" LCD cable TV, DV Recorder, DVD player and stereo, a large fully equipped kitchen and separate formal and informal dining areas including a breakfast bar. In addition there are two bedrooms (both with cable TV), one queen and one twin bedded and a separate bathroom. 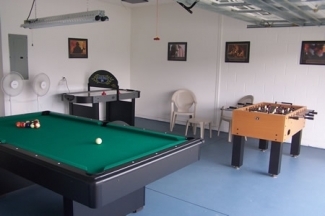 There is a games area with an 8ft slate pool table, 6ft air hockey table and foosball table. Free standing fans are provided for guest use in this area. 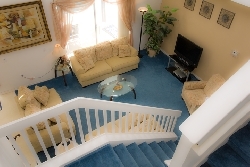 Upstairs has a second living area with Cable TV / DVD / VCR / XBOX & Play Station 2 facilities as well as a computer with high speed internet access and wireless network. 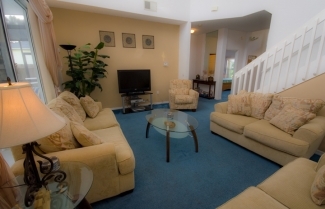 There are two king size bedrooms, one queen bedroom and a twin bedded room - all with cable TV. In addition to the bathroom in the master suite there is a large family bathroom serving the remaining bedrooms. Outside the home has an exceptionally large sun deck area with full size 30ft x 15ft pool and separate spa. Behind the pool is a very large enclosed garden backing conservation land. With privacy fencing down both sides of the villa and single story homes either side, you are totally private. Treat both you and your family to a little extra space. This really is the perfect choice if you truly need a home from home! For long stay discounts, last minute deals and the latest discounts please contact us. Prices are for the villa regardless of the number of guests in the party. Prices are inclusive of 13% taxes. Optional pool heat is available at �20/ per day (minimum 5 days). An initial deposit is required of �100 / 0 per week to secure your dates, with the balance being payable 10 weeks prior to your vacation. We also ask for a refundable security bond of �200/0 that will be returned to you within 4 weeks of your stay providing there are no major breakages or damage. Please note that pets of any kind are not permitted in our villa.